Infrared and Raman microscopies FTIR- microscopy and Raman- microscopy are hyphenated techniques i.e. both of the parts provide information of equal importance to the final result. Let us look at the parts separately and then the combinations and then the similarities. A microscope is a precise optical instrument . It has been developed over centuries in order to reveal the small, and fractions of larger samples that are beyond the normal sight. The microscope allows a sample to be held in a stable manner without vibration so that small areas of a sample may be illuminated and seen at high magnification without distortion. Many years of research and development has resulted in lenses that are aberration free, these produce an image that is in focus across the full field of view. They are used on an infinite variety of samples, some are transparent and some are opaque. The microscope is used to characterise and identify many samples on its own, and for this a number of different illumination methods are used. It is not sufficient to just shine a white light onto or through the sample to reveal all of the components of the sample, many details can only be revealed if the appropriate illumination method is used from the following:- bright field, dark field, polarised, phase contrast and fluorescence. If you do not reveal all of the components then when you try to identify what you see you can only be partially successful. The ability to reveal components of a sample is also governed by the methods of sample preparation and how the sample is presented and the magnification used. A microscope usually has a number of lenses mounted on a turret that have different magnifying powers. These lenses should be parfocal. This means that once one of the objectives in the nosepiece set has been focused on the specimen, all of the other lenses may be used and the focus will be approximately correct for each. In addition the lenses should be co-linear. This enables you to move the lens and select higher magnifications without varying the centre point of the examination. The hyphenated techniques and their widespread use is a result of the development of more sensitive detectors for both infrared and Raman spectroscopies. FTIR is a technique that enables us to identify compounds from their infrared absorption spectrum. Microscopy is a method of sample handling that is suitable for infrared examination . In order to combine these two methods a number of criteria need to be met . The infrared light path should match the white light paths when it travels through the sample. This way you know that the area seen is the same area through which the infrared passes. A selection of IR cassegrainian lenses should be available if a wide variety of samples are to be successfully examined. These include variable magnifications e.g. 15x 36x 52x and an ATR lens. There should be a method of selecting the region from which the IR spectrum is required, this is the apertures. Without an aperture or mask, the signal seen by the detector is usually from the whole field of view. The aperture is essential for obtaining spectral data from specific regions that are smaller than and within the field of view. The aperture should be located at the first magnified image plane of the objective lens. At this point the image is magnified and the aperture which is used to mask the image will be much larger than the sample that is being examined. The long wavelengths used in the infrared have passed through the sample, and the larger aperture will contribute little to any diffusion anomalies, so the full spectrum to 650cm-1 is seen on a flat background from 2 – 3um samples. 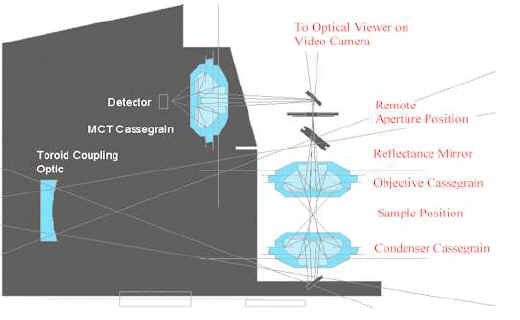 The objective and condenser lenses should be cassegrain mirror lenses, with closely matched numerical apertures. Glass does not transmit sufficient IR light. The detector should be a cooled MCT detector. An image showing the distribution of a particular IR frequency may be produced by having a motorised stepping stage (mapping stage) on the microscope. This is used to move the sample in fixed steps over an area of the sample. A small aperture that allows sufficient energy to pass to give a reasonable spectrum is selected. This is moved in a regular manner pausing after each step in the horizontal direction to collect a spectrum. At the end of each row the stage moves rapidly back to the start of the next row in the directions shown. After all of the data has been collected an absorption band is selected that is characteristic of one portion and by plotting the absorbance value against step distance a map of the distribution may be obtained. Raman microscopy is however limited by only using the overhead pathways for the Raman laser path. This means that the Raman signal is obtained only in the back scatter mode. The laser should travel along the same light path as the visible reflected light used to illuminate the sample. Apertures to separate portions of the sample are not necessary as the laser is a point probe when it has passed through the objective lens. Raman emissions are produced from this focused spot. The Raman emissions need to be separated from the Rayleigh emissions from the sample by either filters (the modern way)or a good spectrometer i.e. double or triple monochromators. The selection of separation depends on the spectrometer of choice for doing the Raman spectroscopy. For FT Raman, filters are almost exclusively used to select the Raman light. The laser focus and the white light focus should be co incident. Therefore as the laser is parallel light infinity corrected optics in the microscope work the best. If the laser is sufficiently powerful, and a CCD detector is used then by defocusing the laser an area may be illuminated. If a separation of the Raman light is now performed then by accumulating the signal an image in Raman light can be produced. This is a Raman map. For FT and other Raman spectrometer systems a mapping stage performs a similar task to that in the infrared microscope system. Raman microscopy is in the main a confocal technique. Emission from a spot source that is focused through an entrance slit in a monochromator means that the spectral data is only collected from the point where the laser is focused. This need not be on the surface, e.g.. samples in glass containers. Depth profiling through a layered sample that does not scatter the laser is possible in Raman microscopy. Spectra of each layer may be obtained without the need to physically separate them. Infrared microscopy, is an absorption technique, and is sensitive to the full light path but at a restricted aperture. Depth profiling is not possible only 2 dimensional separations can be made in infrared microscopy. Glass lenses are suitable for Raman microscopy, however some have spurious lines that arise from the coatings used in their construction. 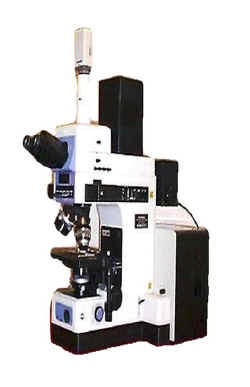 An example of a full research microscope that has all of the microscope techniques available and will interface to Raman and/or any FTIR spectrometers with external beam facilities, the AIRE ENT IR 800R, is shown below. These hyphenated techniques are excellent ways of doing most solid and liquid samples. Raman microscopy is probably the quickest way of examining most samples as there is no sample preparation and you know that when the laser spot is in focus that you will have the best Raman signal. Fluorescence is not as damaging in preventing you from seeing the spectrum in Raman microscopy as it is in conventional 90° collections. This is due mainly to the smaller focal volume of the laser focus burning out the fluorescence more quickly than is possible in 90° work. The CCD detectors and computer techniques help enormously in improving the use of Raman spectroscopy. Infrared spectroscopy has always required sample preparation, and infrared microscopy is no exception. Good sample preparation and the correct use of the microscope greatly improves the quality of the information that you may obtain from the technique. The more you use the microscope the more familiar you will become with the controls. Problem solving will be easier if you can combine the information you gather from microscopy with the spectroscopic results. Microscopy when used in a combined technique with a spectroscopy gives an added value to the analytical results that is not possible when they are used separately.